Do you have a promise that has not been fulfilled? Has every glimmer of hope been extinguished, are you weak and shaken by the absolute impossibility of what you see? - Don't let go, it's not a problem to God! If it 'can't happen', that just makes you a candidate for a miracle! God's Word works! Everything needed to fulfil your promise was contained within that promise the very first time the Lord made it known to you. The Word of God is not 'like' a seed - it IS a seed. Contained within every seed in nature is the life-giving DNA, written by God - the entire plan for the future of that seed! If God has spoken to you, given you the seed of His Word, receive it, keep it, don't let it go! When the angel spoke to Mary, she believed it, received it, 'Let it be to me according to Your Word' (Luke 1:38). And Elizabeth recorded of her, 'Blessed is she that believed: for there shall be a performance of those things which were told her from the Lord.' - God will do it! Is it hard for you to hold on? Don't abort the Word of God. Be like Mary, hold on to what God has said, keep it in your heart. God's promises are not worked out in the ordinary way, but according to His plan, His timing, His order. It may be impossible to you. But remember, the Angel said to Mary, 'With God nothing is impossible' (Luke 1:37). 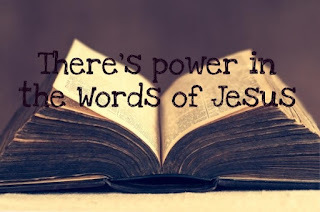 There is power in the Words of Jesus.